Afghanistan’s history spans five thousand years and the Afghan people have contributed to the emergence of many Central Asian empires. The ancient centers of culture and civilization were influenced by diverse outsiders such as Greece, Arabia, Iran, Central Asia, India, and China. The borders of Afghanistan were established in 1893 through negotiations with the British, and provincial governments emerged, taking the place of clan rule. In 1919, Afghanistan gained independence from British occupying forces. From 1919-1973 Afghanistan modernized and built extensive infrastructure with the assistance of the international community. This period of relative stability ended in 1973. In 1978 and 1979, a number of coups brought to power a communist government that drifted increasingly toward the USSR, ending with a Soviet puppet government in Kabul and an invasion of Soviet forces. Throughout the 80s, an indigenous Afghan resistance movement fought against the invading Soviet forces. On February 15, 1989, the last Soviet soldier retreated across Afghanistan’s northern border. As hostilities ceased, more than a million Afghans lay dead and 6.2 million people, over half the world’s refugee population, had fled the country. The Soviet withdrawal in 1989 weakened the then communist government which later demised in 1992. An interim government was established by the Mujahideen Council in 1992 and was followed by the country’s Islamic political movement. The government remained unstable and unable to form a national consensus amongst its various factions. This instability was exploited by a group of Islamic fighters called the Taliban (‘Talib’ means ‘religious student’ or ‘seeker of knowledge’). With the assistance of foreign governments, organizations, and resources, the Taliban seized Kandahar and in September 1998 entered Kabul. Taliban rulers became infamous for their repression of women and dissidents as well as their destruction of the country’s cultural heritage. Showing little interest in trying to govern and rebuild Afghanistan, they instead played host to the radical Al-Qaeda terrorist network. Following Al-Qaeda’s 2001 attacks, the United States and its allies began military operations and quickly overthrew the Taliban. An interim government was installed. In December of 2001, Afghan and world leaders met in Bonn, Germany under United Nations auspices to design an ambitious agenda that would guide Afghanistan toward “national reconciliation, a lasting peace, stability, and respect for human rights,” culminating in the establishment of a fully representative government. Many political and civil institutions were established with the Bonn Agreement, such as the Afghan Independent Human Rights Commission, the Judicial Commission, Counter- Narcotics Directorate, and the constitutional commission. Progress on the political front has been rapid, with elections leading to an elected parliament and president as well as a national constitution. With international assistance, the new government of Afghanistan is developing a stable political infrastructure and security apparatus. ISAF was created in accordance with the Bonn Conference, in December 2001. NATO took over command and coordination of ISAF in August 2003. ISAF currently numbers about 9,700 troops from 37 NATO and non-NATO troop-contributing countries. The Alliance is expanding its presence in Southern Afghanistan. The London Conference on Afghanistan in January 2006 aimed to launch the Afghanistan Compact to present the interim Afghanistan National Development Strategy, and to ensure the Government of Afghanistan has adequate resources to meet its domestic ambitions. The Afghanistan Compact marks the formal end of the Bonn Process, with the completion of the Parliamentary and Provincial elections, and represents a framework for co-operation for five years. The Interim Afghanistan National Development Strategy (I-ANDS) is the product of twelve months of intensive consultations within the Afghan government and with a wide array of stakeholders including community representatives, the ulama, the private sector, NGOs, and the international community. The document outlines the government’s policy objectives and analyzes the obstacles to their achievement. Afghanistan is located in the Heart of Asia, Roundabouts for Asia and Europe. It is a landlocked mountainous country located within South Asia and Central Asia. The country is the 40th largest in the world in size. Kabul is the capital and largest city of Afghanistan, located in the Kabul Province. The other biggest cities in the country are Herat, Mazar-e-Sharif, Nangarhar, Kandahar, and Kunduz. 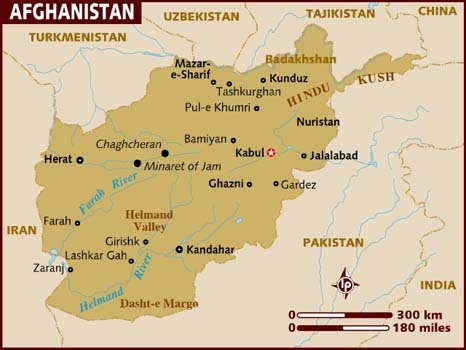 Afghanistan is completely landlocked, bordered by Iran to the west (925 kilometers), by the Central Asian States of Turkmenistan, Uzbekistan, and Tajikistan to the north and northeast (2,380 kilometers), by China at the easternmost top of the Wakhan Corridor (96 kilometers), and by Pakistan to the east and south (2,432 kilometers). Afghanistan may be described as semi-arid for the most part but regional variations and climate contrasts according to levels of elevation. Annual rainfall is low, but the high mountains contain sources for many streams and rivers which supply water for cultivation. Afghanistan is cold in winter. Snow falls in the central northern and northern east provinces. Eastern provinces are very warm in the summer but pleasant in winter. In general, Afghanistan has a pleasant weather in summer and specifically its spring has been celebrated warmly throughout the nation. It rains a lot in the spring where the rain level in the summer is quite low. According to the survey made by Central statistics office (CSO), the Islamic Republic of Afghanistan, the total population of the country is 29.2 Million. 14.9 Million Population consists of Male and 14.2 Million consists of Female. 20.7 Million Population is living in the suburbs and 6.9 Million are living in the cities. For centuries, Afghanistan has been a mosaic of people with diverse cultures, religions, and languages. Afghanistan’s ethnically and linguistically rich and mixed population reflects its location at the crossroads of Central, South and Southwest Asia. Communities with separate religions, languages, and ethnic backgrounds have lived side by side for generations. Afghanistan still remains a country of dynamic diversity. The main ethnic groups are Pashtun, Tajik, Hazara, Uzbek, Turkmen, Aimaq, Baluch, Nuristani, Pahashaye, Barhawe, Arab, Gujar, Pamiriyan, and Kizilbash. Pashto and Dari are Afghanistan’s official languages. Afghanistan’s Constitution stipulates that all other languages are “official” in the areas in which they are spoken by a majority of the population. Afghanistan is an Islamic country. An estimated 80% of the population is Sunni, following the Hanafi School of jurisprudence. The remainder of the population is predominantly Shi’a. Religious minorities of the country include Hindus, Sikhs, and a small community of Jews who have left the country during the decades of war. Artistic activity in Afghanistan can be traced back as early as 18,000 BC. For centuries Afghanistan linked the civilizations of Iran, India, and China. In the Islamic Era, the Ghaznavid rulers of the 10th to 12th centuries and the Ghorids fostered artistic development. Continuing through the Timurid dynasty, Afghanistan’s cultural life prospered and flourished through the rulers’ high regard for men of learning and artists. The descendants of Timur turned the city of Herat into a center of cultural activity enticing artists such as Abdul Rahman Jami, Abdulhay, and Kamal al-Din Bihzad to create finely illustrated books and exquisite buildings. Folklore and legends told through song and storytelling are a centuries-old tradition in Afghanistan and continue to thrive today. Afghanistan has a rich literary tradition as well. During the medieval period, literature was written in Dari, Pashto, Turkic, and Arabic. The royal courts of regional empires such as the Samanids, the Ghaznavids, the Timurids, and the Mughals, were great patrons of Persian literature supporting literary geniuses like Rumi, Rudaki, Abdullah Ansari, Ferdowsi, and Jami. One of the most important works of this period was the Dari epic poem Shah Nameh (The Book of Kings), completed in 1010 by Firdawsi and comprising 60,000 rhyming couplets. Another famous poet, Jalalaluddin Rumi Balkhi (1207-1273, also known as Rumi) from Balkhi, is considered one of the greatest Sufi poets. Much of his writings have been translated from Farsi into English. In the 16th-18th centuries, many literary figures originated from Afghanistan but due to the partition of the region between Safavid Persia and the Mughal Empire, famous poets moved to literary centers. Khushal Khan Khattak, a 17th Century Pashtun poet and warrior, lived in the Hindu Kush foothills. He used verse to express the tribal code. By the late 19th century Pashto sung poetry had been formalized at the royal court into the classical genre known as ghazal, in recognition of the fact that music can be a powerful way to deliver great poetry. While Afghan literature can be split into Persian, Turkic, and Pashto, there is a shared tradition and heritage that unites the consciousness of all Afghans and is reflected in the literature. For example, a tradition of military prowess and invincibility presents itself in the literature, whether it is a product of Khyber Pass Pashtuns, Uzbek Central Asians, or Tajik mountain ghazis. In the 20th century, Kabul became the center of publishing. Mahmud Tarzi (1865-1933), a reformer and editor of Kabul’s first literary publication, Seraj ul-Akhbar, was instrumental in developing a modern literary community. Afghanistan has produced several literary figures including Khalillulah Khalili (1907-1987) and Sayed Buhaniddin Majruh. A neo-classicist poet, prose writer, poet laureate, and ambassador, Khalili defined the Afghan Renaissance man. Ancient and modern architecture in Afghanistan combines elements from Iran, India, and Byzantium. Afghanistan is filled with architectural gems. Mosques, fortresses, and minarets reveal the artistic glory of past empires. The best sites to view architectural masterpieces are Herat, Bamiyan, Mazar-e Sharif, Balkh, Ghazni; however, architectural sites are spread throughout the country. Efforts are currently being made to preserve Afghanistan’s many historical sites. Tragically, some of Afghanistan’s greatest cultural treasures, such as the Bamiyan giant Buddha statues, were destroyed by the Taliban. Other cultural heritage sites, such as the Heart mosque with its intricate ceramic tile designs, the hauntingly hidden Minaret of Jam, and the imposing Mazar-i-Sharif mosque have been preserved. The Kabul Museum is also undergoing extensive renovation. The museum, which once housed the most comprehensive record of Central Asian history, was bombed numerous times throughout the nineties, causing extensive damage to the collection. Despite efforts by the United Nations and devoted museum staff to protect the remaining collection, thousands of antiquities were plundered for the illegal antiquities trade. Today, many of these items are being recovered, as efforts to restore and preserve Afghanistan’s rich cultural heritage continue. Etched into the dappled sandstone of the Bamiyan Mountains are the faint remains of the once colossal Buddha statues that silently watched over the Bamiyan Valley for 1500 years. The Taliban’s destruction of the 174-feet and 115-feet tall monuments caused an uproar in March 2001. Recent efforts in the region hope to restore their magnitude and reintroduce their cultural significance. The statues, which took Buddhist monks several decades to construct, date back to the 3rd and 4th century. Composed of mud-and-straw plaster and stucco, the Buddhas also harbored a variety of frescoes that decorated the walls in their vicinity. Until the 9th century, Bamiyan was a thriving Buddhist metropolis. Lying along the Silk Road, the area was frequented by many travelers who traversed the famous trade route linking China, Central Asia, and Europe. Bamiyan’s beauty and the majestic presence of the buddhas have recounted in several ancient texts. The structures, though over 1,500 years old, were remarkably resilient to demolition. The Taliban required several weeks of bombings to finally crumble the monuments, which they deemed idolatrous and un-Islamic. In 2003, in the wake of the Taliban destruction, UNESCO declared Bamiyan a World Heritage Site. Beneath the shards of detonated bombs and rubble, archaeologists and other experts are attempting to gather and reassemble parts of the statues. Some hope that recovery of the fragments will lead to preservation and more importantly, reconstruction of the Buddhas. Due to a lack of detailed photography, it is increasingly difficult to match fragments to their corresponding statue, but modern technology allows geologists to “fingerprint” pieces of the statues, which will later be scanned into computers and used to assemble the fragments. However, many Afghans and cultural experts believe that the statues should not be rebuilt and that their absence is a stark reminder of the cultural destruction of the Taliban era. Recently, archaeologists, engineers, and architects have flocked to the Bamiyan Valley to search for buried Buddhist monasteries as well as a legendary 1,000-foot long reclining Buddha statue. Zemaryalai Tarzi, an Afghan archaeologist, believes another giant Buddha may be hidden deep beneath the earth in the Bamiyan valley. A Chinese visitor in 632 described a reclining figure 1,000 feet long – if the account is accurate, the reclining Buddha is as wide as the Eiffel Tower is long. Tarzi’s recent excavations have unearthed one of the 10 monasteries that he says existed in Bamiyan. While the monastery did not yield any signs of the sought-after statue, the discovery was nonetheless an important step in reclaiming the cultural heritage and history that diminished with the demise of the two Giant Buddhas. The modern educational system was introduced at the end of the 19th century by the Afghan government and combined traditional Islamic learning with a modern curriculum. In 1935, education was declared universal, compulsory and free. With its expansion, the secular system came to be regarded as the principle medium for creating a national ideology and emphasized productive skills. By the 1960s, technical education assumed critical importance as a result of Afghanistan’s development drive. The Afghan educational system is currently experiencing a period of rehabilitation and reconstruction. Twenty years of conflict caused the exodus of many teachers and qualified instructors and caused literacy rates to plummet. Violence throughout the country during the Soviet invasion, the Civil War, and the Taliban period made the existence of primary and secondary schools near impossible. Schools still existed during these times, but they had little access to resources or qualified professionals. Today, starting at age seven, children attend six years of primary school, three years of middle school and three years of secondary school. Afghanistan’s Ministry of Education provides a specialized curriculum and textbooks that have been developed with the assistance of Afghanistan’s international partners. Today, more than 8 million students are enrolled in school, including more than 2.5 million girls, while the total number of students enrolled in 2002 was less than one million. Traditional religious schools, found in towns and villages, teach children basic moral values and ritual knowledge through the study of the Qoran, the Hadith (Sayings of the Prophet Mohammad), and popular edited religious texts. Herat, Kunduz, Ghazni, Kandahar, and Kabul have become important centers for religious scholars. Higher education also suffered during the 1980s and 90s, the Afghan government is striving to recruit foreign professors, computerize the universities, and train young Afghans to be qualified professionals in today’s competitive market. Currently, there are universities in Afghanistan educating 400,000 students (19% women, 81% men), a tenfold increase from the 4,000 enrolled in 2002. • Developed capacity at the Central MOPH for coordinating and managing donor funds. In Kabul, state of the art hospitals have opened and clinics have been built and staffed all over the country. However, there is much left to be done. The new system has improved the health and life expectancy of Afghans from 42 years in 2002 to 64 years in 2012. In 2014, 57% have access to a health facility less than one hour from their home. In this period, more than 600 health facilities, which serve one million people per month, are built. Currently, besides government sector healthcare facilities, there are various health care centers and hospital operating through private sector as well. The access to health services has been quite changed rather than before. Afghanistan saw a revolution of Technology in a very shorter period of time. Mobile and internet services covered the entire country is a way, which was not even expected. People who were traveling from villages to cities aiming to make a phone call in the year 2002 are now having access to the modern technology used worldwide. Central statistics office of Afghanistan (CSO) says, in the year 2016, 6678 towers communication services coverage have been installed across the country which covers all most all the provinces in the country. It also indicates that the number of Mobile and landline phones and internet users are increasing day to other. Most of the users are youth, who strive to get access to internet services. People in Afghanistan are celebrating the first Day of New Year (Persian New Year) as per its historical value. They congratulate the day with happy year wishes to each other. Two other Festivals, Eid ul Fitr and Eid ul Adha are religious festivals. Eid ul Fitr is celebrated after the Holy month of Ramadan. Eid ul Adha is celebrated two months after the Ramadan and people sacrifices Goats, Buffalos, sheep, and cows. Ashura is a religious festival, relating to the Death of Imam Husain, the Grandsons of Mohammad (BEUH). Shia and Sunni Muslims celebrate this day in Masjid with the recitation of Holy Quran and distribution of food. Meelad ul Nabi is another religious festival. The Prophet Mohammad (PBUH) got birth in this day. Sunni and Shia Muslims celebrate this festival with the recitation of Holy Quran and distribution of food. The executive branch of the Afghan National Unity Government consists of a powerful and popularly elected President, two Vice Presidents and a Chief Executive Office. A National Assembly consisting of two Houses, the House of People (Wolesi Jirga) with 249 seats, and the House of Elders (Meshrano Jirga) with 102 seats from the Legislative Branch. There is an independent Judiciary branch consisting of the Supreme Court (Stera Mahkama), High Courts and Appeal Courts. The President appoints the nine members of the Supreme Court with the approval of the Wolesi Jirga.